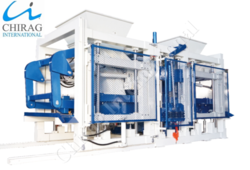 Our range of products include concrete block making machine, multi-function concrete block making machine, fully automatic concrete block making machine, semi-automatic concrete block making machine, multi material concrete block making machine and fully automatic concrete paver block machine. Target User: requires high production output of concrete blocks, in different types, sizes, shapes and colours.Applied Products: concrete blocks, solid/hollow/cellular masonry products, paving stones with or without face mix, garden and landscaping products, slabs, edges, curb stones, grass blocks, slope blocks, interlocks etcApplied Fields: widely used in buildings, road paving, squares, gardens, landscaping, city constructions, etcRaw Materials: crushed stone, sand, cement, lime, flyash, cinder, slag, gangue, gravel, perlite, and other industrial wastes.Main Features:Ø Uses Delta PLC control system and Delta Touch Screen.A. Visualization screen with easy operation;B. Is able to set up, update and amend the production perimeters, to maximize the production output;C. Dynamic display of the system status, automatic trouble shooting and warning notice;D. Has automatic-locking function, avoiding mechanical accidents caused by operational mistakes;E. Is able to troubleshoot the machinery via tele service. 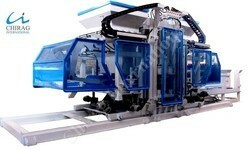 Uses high dynamic proportional and directional valves, which automatically adjust the oil flow and pressure as per specific working requirements to buffer the hydraulic cylinder when working; uses integrated high pressure and soft oil pipes, with easy installation; Uses 360 multi shaft rotating and compulsory feeding, which greatly improves the density and intensity of the blocks, and reduces the feeding time as well; Integrated structure of vibrating and moulding latforms, which reduces the weight of the machine, an improves the vibrating efficiency; Four rods guiding system and high-precision long guide bushing are used to assure the precise movement between the tamper head and the mould; Heavy duty machine frame which uses high density steel and advanced welding technology is vibration proof. Target User: requires high production output of concrete blocks, in different types, sizes, shapes and colours.Applied Products: concrete blocks, solid/hollow/cellular masonry products, paving stones with or without face mix, garden and landscaping products, slabs, edges, curb stones, grass blocks, slope blocks, interlocks etcApplied Fields: widely used in buildings, road paving, squares, gardens, landscaping, city constructions, etcRaw Materials: crushed stone, sand, cement, lime, flyash, cinder, slag, gangue, gravel, perlite, and other industrial wastes.Main Features:Ø Uses Delta PLC control system and Delta Touch Screen.A. Visualization screen with easy operation;B. Is able to set up, update and amend the production perimeters, to maximize the production output;C. Dynamic display of the system status, automatic trouble shooting and warning notice;D. Has automatic-locking function, avoiding mechanical accidents caused by operational mistakes;E. Is able to troubleshoot the machinery via tele service. 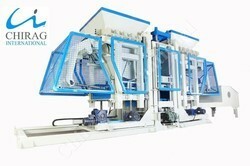 Uses high dynamic proportional and directional valves, which automatically adjust the oil flow and pressure as per specific working requirements to buffer the hydraulic cylinder when working; uses integrated high pressure and soft oil pipes, with easy installation; Uses 360 multi shaft rotating and compulsory feeding, which greatly improves the density and intensity of the blocks, and reduces the feeding time as well; Integrated structure of vibrating and moulding platforms, which reduces the weight of the machine, an improves the vibrating efficiency; Four rods guiding system and high-precision long guide bushing are used to assure the precise movement between the tamper head and the mould; Heavy duty machine frame which uses high density steel and advanced welding technology is vibration proof. 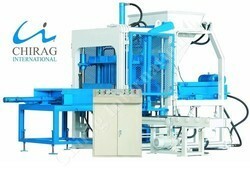 Looking for “Concrete Block Making Machine”?